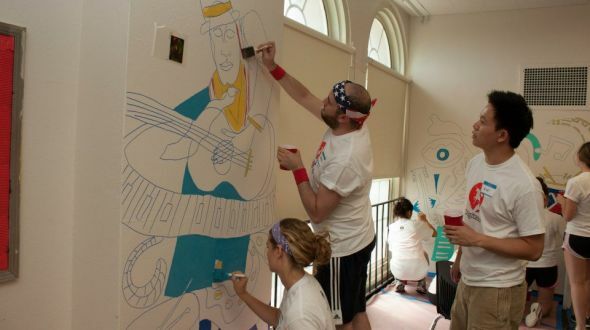 On Thursday, July 16 Urban Initiatives worked on a Corpsgiving-coordinated project with 350 volunteers from Digitas. The mission: give Lawndale Elementary Community Academy a much-needed makeover! UI staff members April, Shy, and Kyle headed to Lawndale Elementary Community Academy, one of UI’s newest partner schools, early in the morning on July 16. Lawndale Elementary is housed in a beautiful, nearly 100-year old former Jewish Community Center. The building has seen a lot of love over the years, and it was in major need of some TLC. Over the course of the day, team leaders and volunteers undertook a complete transformation of Lawndale’s lobby, stairwells, classrooms, and hallways. Aging yellow paint was replaced with bright murals featuring musicians, swirling color patterns, and the school mascot – the panther. Check out this awesome time-lapse video to see a tiny fraction of the work as it progressed. Thanks to everyone at Corpsgiving and to the incredible team from Digitas for making this event a smashing success.